Do we really need another social network to waste hours of our lives? Better yet, how has a network that is still invitation-only managed to get 2.7 million users (and that is just those who are signing in with Facebook)? Pinterest is a social bookmarking tool used to “pin” images found around the Web into categorized collections, or boards. Think of it like an interactive, shareable scrapbook. Like any good social network, you can follow other users, share their content, make comments, and tag users. Similar to a Twitter stream, you get real-time updates of what the people you follow are pinning. 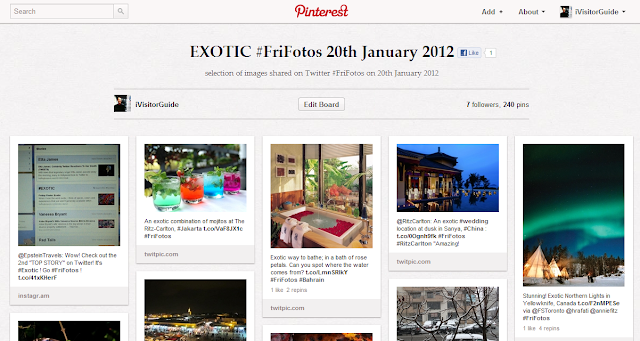 You can also easily share your pins on Facebook and Twitter. 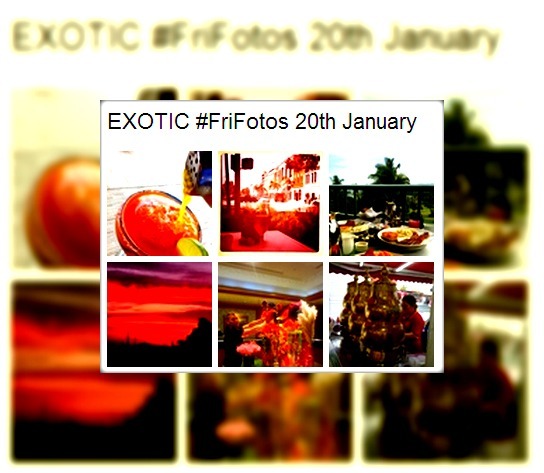 This collection of images were all contributed by Twitter fans of #FriFotos. Founded by Jonathan Epstein aka @EpsteinTravels and co-hosted by such other travel luminaries as Annie Fitzimmons (@anniefitz), Christine Kirk @LuxuryPRGal, Charles Yap (@HotelPRGuy) and Stephanie Diehl (@TravelDesigned) this weekly event attracts a host of people all contributing images based on a new subject. Last week (Jan 20th) the theme was #Exotic. Pinterest enabled me to 'pin' all of these images and add them all to one on-line notice board - so you can see all of them in one place. Simple. And it takes seconds to add a new image to the story board. In the days since literally hundred of Pinterest users have viewed, liked, pinned and commented on many of these images indicating that that this is a great platform to market your brand through image collections and engage with new audiences. While there aren’t a lot of brands using Pinterest yet, I expect that to change very soon. The audience on Pinterest is different from the major social networks because most people use it to find inspiration, whether they are hosting a party, getting married, remodeling their bathroom, or looking for a recipe for dinner. In other words, many are using Pinterest to help guide their buying decisions. If a user finds something they like on Pinterest, there is a good chance they will at least click the source link and, at most, make a purchase. It has the potential to be a wonderfully compelling marketing tool for business - especially in travel and tourism. On the surface, Pinterest may seem too niche to benefit a wide range of brands. As with any network, once Pinterest grows there will most likely be features added specifically for businesses (promoted pins? sponsored boards?). For now, there are 3 main benefitsfor brands using this network…. Pinterest levels the playing field for smaller retail businesses that don’t have the budget or resources to compete in search results. If I search for jeans on Google Shopping, I’m going to see Levi’s and a bunch of other brands I already know sell jeans. “Discoverability” is a word I’ve seen thrown around a lot regarding Pinterest. Meaning, Pinterest helps people find new products/brands/styles they would normally not come across by plugging keywords into a search engine. Chances are, the people I choose to follow on Pinterest have similar taste to me. I know I can check out their pin boards and probably see pins of jeans that would suit my taste. If I do a search for jeans on Pinterest, I know I’ll find trendy options and smaller brands I don’t know about, or even a DIY project for turning an old pair of jeans into a mini skirt. If I search for jeans tomorrow, I will see something new since results change as new pins are added. Anytime someone pins something from your site, it automatically pulls in not just the image from your site, but also a link. There is a chance for that pin to be repinned multiple times (even hundreds of times, in some cases), building up a healthy amount of backlinks. Here’s a great post that makes the case for linkbuilding on Pinterest. If people love your products and they’re on Pinterest, they will not only pin your stuff, but they might dedicate an entire pin board to your brand!